Everything is OKAY: Season 2: a kinetic installation, exploring emojis and text messages and the effects of new communication technologies on society. Opening this week is a solo exhibition by New York-based, French artist Antoine Catala, titled Everything is OKAY: Season 2 at Marlborough Contemporary. The show brings together both new and existing works to form a kinetic installation, exploring emojis and text messages and the effects of new communication technologies on society. 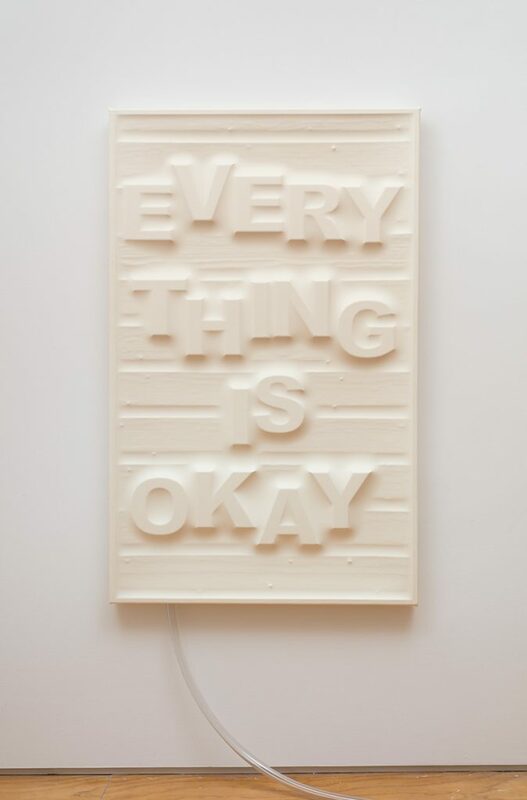 Everything is Okay (ground), 2017 latex, wood, foam, pump 58 × 36 inches (147.32 × 91.44 cm) Courtesy the artist and 47 Canal, New York. Photo: Joerg Lohse. Text messages allow us to communicate as quickly as we speak. They enable multiple conversations at once, bridge geographical distance and fit around our modern, fragmented lives, reflecting our easily distracted minds. Catala explores how this minimal version of interpersonal communication can lead to misunderstanding, and in a time lapse between messages, discomfort can easily grow. This is where emojis come in – symbols to diffuse tension and state the intended “mood” of the message as a substitution of vocal intonation. Hence the exhibition’s mantra: Everything is OKAY. 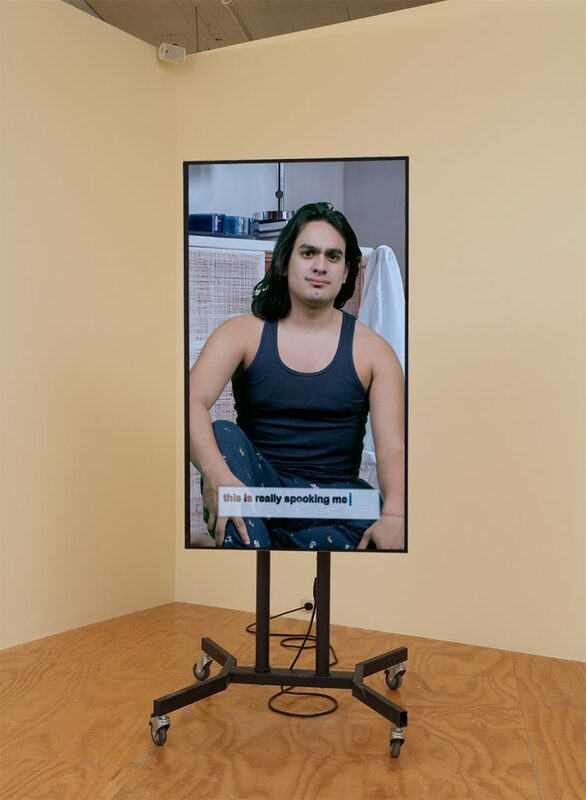 I am here for you (t-shirt), 2017 silicone rubber, resin coated foam, pneumatics 10 × 34 × 31 inches (25.40 × 86.36 × 78.74 cm) Courtesy the artist and 47 Canal, New York. Photo: Joerg Lohse. The show has the feel of a haunted house, driven by a loop of videos and songs as an opera in multiple acts. It is centred around a narrative and transforms the gallery space into an uncanny domestic setting. ‘Flat Sitcom’ constitutes two vertical monitors facing each other, set vertically to mimic smartphone screens. Both show a protagonist, their texts to each other appearing at the bottom of the screens playing out various disturbing “episodes”. The suspense is relieved by a recurring theme song which is played between each episode, at which point other emoji objects in the room – for example, wall panels, socks, t-shirts and plastic bags – animate and join in. Catala is greatly influenced by the media theorist Marshall McLuhan, who is hailed for predicting the birth of the internet with his model of the futuristic “Global Village”. He also warned of the potential dangers involved, such as the manipulation of our senses for the benefit of private bodies and how our worldview may come to be altered – consider the recent “Fake News” scandal. 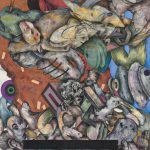 In his works, Catala reflects how communication is almost entirely corporation driven and is shaped and owned by the platforms we use. In the face of this increasingly financial society, emojis become a refuge for individualism. Flat Sitcom, 2017 TV, TV stand, mini-computer Courtesy the artist and 47 Canal, New York. Photo: Joerg Lohse. 2014, 2012); Galerie Christine Mayer, Munich, Germany (2017 & 2015); Hirshhorn Museum and Sculpture Garden, Washington DC, USA (2016); Whitechapel Art Gallery, London, UK (2016); MoMA PS 1, New York, USA (2013); and Palais de Tokyo, Paris, France (2012). 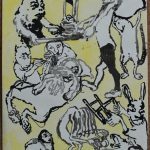 His work has been included in The Riga International Biennial of Contemporary Art, Latvia (2018), the New Museum Triennial, New York, USA (2015), and the 12th Lyon Biennale, France (2013). 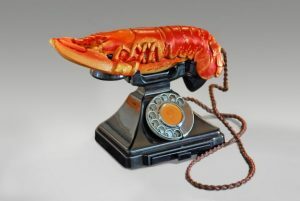 This entry was posted in Art Openings, Art Previews, EXHIBITIONS and tagged Antoine Catala, Marlborough Contemporary. Bookmark the permalink.